At AustralianLight we specialise in Floating Acrylic presentation of our images… But what is a "Floating Acrylic"? Well, we think that it's the ULTIMATE finish for our images. We use a special archival metallic gloss paper to make the print, which is then face-mounted to 4.5mm optically clear acrylic and backed with 3mm Dibond panel for strength and stability. A hidden hanging frame is mounted on the back so your print appears to 'float' off the wall. 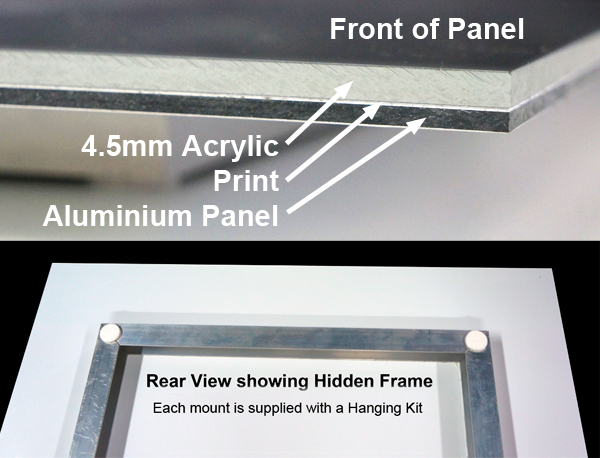 A wall mounting bracket is supplied and once it has been levelled and fixed to the wall, it's a simple matter of sitting the print's hanging frame in place…. no more endlessly adjusting crooked images! Floating Acrylic presentations are just as happy framed, as they are unframed. However should a frame be required, we recommend that a wire hanger be used instead of the hidden subframe. This allows the image to hang over the wall mounting bracket, but rather than float, it contacts the wall for a more traditional framed look. If you have any questions about our mounts and frames, please do not hesitate to contact Russell on 0416 143 908.